I really like the floaty nature of my rectangle maxi dress and wanted to try it again, this time with tank top styling above the waist and narrower throughout. I used the front and back pieces of my T-shirt dress pattern to get the proportions right and the bust dart in the right place. I widened the pieces at the bottom of the armhole to 20″ and cut straight down from there (no extra for seam allowances), adding 19″ to the length (for 57″ finished length from the shoulder, and 1½” hem allowance). I made the neckline slightly deeper and wider, and cut in the armholes. At this point, I was winging it, just drawing the curves directly on the fabric, using one of my curved rulers. 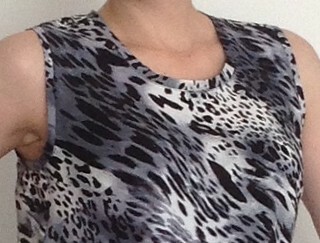 I used my other piece of rayon challis, also from Fabric Mart. Having learned from the previous project, I minimized the shiftiness of the fabric by using fusible tape around the armholes and neckline before cutting them. Leopard print – you never thought you’d see me in that, did you? I made the slit longer this time. I tried on the half-finished dress, with both side seams sewn all the way down, and put a pin at the kneecap. Then I ripped out the stitching and tried it on again… perfect! Plenty of room for movement, no thigh flash. I didn’t know how I was going to finish the neckline and armholes when I started the project. It took consulting my sewing books to settle on a bias strip finish. It was surprisingly easy – I think because the fusible tape stabilized the edges. And I like how it turned out. Another comfy summer dress. I think I’m set for summer heat now. Probably should have thought of this at the beginning of the summer but better late than never. Tak toto sa podarilo fakt výborne, čapkám Ti! Great dress, looks super comfy. Like the bindings on neck and armholes, give a clean edge that is cool. Great drafting. I really like this on you! I’m so glad that I’ve inspired you to make a couple of these cause they really are comfortable to wear! Yes, good choices. Looks great! Lime green scarf? I wouldn’t have guessed that this was improvised – it looks very well executed and fine tuned. Nice dress! Fabulous and such a great print. Alexandra, You look lovely in your new maxi dress. Love the print and the whole look. You wrote: “I minimized the shiftiness of the fabric by using fusible tape around the armholes and neckline before cutting them.” When you have time, would you please clarify this for me? Where do you put the fusible tape — on the inside of the cutting line, on the seamline, outside the cutting line? And is it the kind that you just press on with your fingers or do you need to press it with an iron? Oops, I might be overthinking this — it’s just that I’ve never seen this idea before, and I have a couple of fabrics that I could use this technique on. Thanks! Beautiful dress! Love the material.